Arkansas: The Birthplace of Cheese Dip. 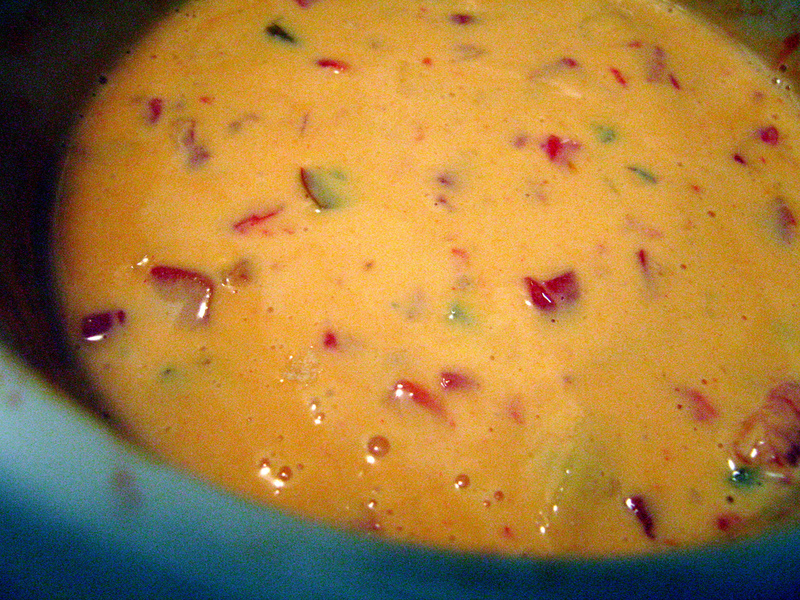 Cheese Dip: The State Food of Arkansas. The staple appetizer at practically any restaurant you visit. The required tailgate food. The perfect topping for chips, chili, rice, and, yes, even burgers. It’s simplicity can be summed up in 2 ingredients: Velveeta and Ro*tel. A match made in heaven if you ask me. Being raised in Arkansas, I’ve never even considered that some people have never had the pleasure of tasting this delightful dish, not to mention being oblivious to the mere existence of Ro*tel. This weekend, however, I learned that one of my dear friends “up North”, Jules, was one of those unfortunately oblivious souls. Upon finding this out, it became my mission yesterday to force her to make Ro*tel Cheese Dip, or as I like to call it – Ro*tel. In a series of IM conversations, a phone call, tweets, and the offer of a Skype session, I convinced Jules to gather the necessary ingredients and make Ro*tel for dinner. Me: So in two weeks, I’ll be attending the World Cheese Dip Championships in North Little Rock with Adam. Jules: What IS this obsession with cheese dip in Arkansas? Me: Well, number one it’s fabulously delicious. Number two it’s the perfect dish. Jules: I’ve never understood why a restaurant in Arkansas, no matter the cuisine it serves, has cheese dip on the menu. Are you all really that addicted? Jules: So tell me this, how does one buy cheese dip? Me: Well, what kind of cheese dip are we talking about? Jules: You mean there’s different types? Me: Yes, yellow and white are the most popular. Me: In my opinion, yellow is not as smooth or spicy as white. I typically order white cheese dip whenever I’m at a restaurant. But at home I make yellow, using Velveeta cheese. Jules: I’m not a big user of Velveeta, but my husband was raised on it. Me: Okay, then you HAVE to make Ro*tel. If your husband was raised on Velveeta, he’ll love you more than ever after you make this dip. Me: Ro*tel? It’s diced tomatoes and green chilies. Jules: How do you spell it? R-O-W-T-E-L-L-E? Jules: You mean there’s actually a star in its name? Jules: Can I buy it up here? Me: Yep, there’s 5 stores that carry it in your town! Go. Now. Jules: Where will I find it? Me: Probably in the canned vegetables, next to the tomatoes. You’ve seriously never seen or heard of Ro*tel before? Wow. Jules: Okay so besides Ro*tel, what else do I need to make this cheese dip? Me: 1 pound of Velveeta and 1 can of Ro*tel. Jules: How do I prepare the Velveeta? Me: Dice it up and throw it in a bowl, then pour the Ro*tel on top. Nuke it until it’s nice and melted, stirring about every minute and a half to 2 minutes. I usually drain the Ro*tel because I like a thicker dip, but you can leave the juice if you want a thinner dip, totally up to you. Jules: I have my grocery list ready! What goes good with the dip for dinner? Me: Ha! It’s always just my meal. Me: Seriously, but you could do tacos, burgers, fajitas, or chili. Jules: We should just dip our burgers in the cheese dip. Just kidding. Me: Even better, you could top your burgers with cheese dip…and bacon. I’m serious. Jules: Ok, I’m heading to the store. Jules: So 2 lbs velveeta and a can of rotel? Me: NO!!!! 1 lb to 1 can. Jules: So if I make 2 lbs I use 2 cans? Me: Yes, that’s typically how math works. Jules: Ok, heating up now. Me: Ok, how is it? I need an update? Jules: It was verra verra good! I am stuffed. We all enjoyed it, ate lots. Me: Yay! Nothing makes me happier than a new Ro*tel lover. And that, my friends? Is how I convinced Jules to make Ro*tel for the very first time. Everyone loved it and her daughter Caity, who I’m told does not like Velveeta, deemed it “pretty good”. So to Jules and her family: I’m glad I could educate you on the state food of Arkansas. May you have many many more bowls of cheese dip and Ro*tel in your future! “In Queso Fever: A Movie About Cheese Dip” from Nick Rogers on Vimeo.